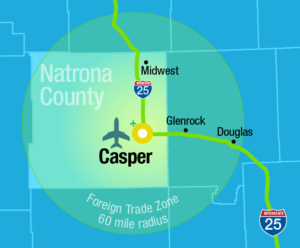 The Casper/Natrona County International Airport has an active Foreign-Trade Zone which was just approved for an alternative site framework that extends the FTZ a 60-mile radius from the airport. A Foreign-Trade Zone (FTZ) is a specific area where any form of imported merchandise may be stored, packaged, assembled, manufactured, cleaned, sorted and graded without the expense of Customs duties or taxes. What are the benefits of a FTZ? Import duties are not paid until the goods leave the Zone. Re-exported goods are never entered into U.S. commerce and are not subject to Customs duty. No duty is paid on scrap, waste, or damaged goods. The company has the use of the duty dollars for the time the goods are in the FTZ. The final duty rate paid is that of the component part or of the finished article, whichever is lower. Products transferred from Zone to Zone are duty-free. Most merchandise subject to quotas may be held in a Zone until quotas open.